If you are tired of classic and formal online casinos and are looking for a special spice at a gambling venue that would be enough to have you engaged and motivated to stick around, Yeti Casino is the perfect place for you. Joy and excitement are two things Yeti Casino want to make sure their customers are feeling while they are playing at either some of the top-notch slot titles from the world’s best developers, or when they sit at a virtual table for a round of blackjack, punto banco, baccarat or poker. Yeti Casino is inviting you to drop by and have a full taste of this cool operator. You don’t even have to make a deposit in order to get a piece of action as Yeti Casino rewards their players with a 23 Free Spins No Deposit Bonus on Joker Pro or Starburst which will be more than enough to provide you with a glimpse inside this fun looking and light-hearted gambling venue. Yeti Casino does not come with a mobile app just yet, given the fact we are talking about a venue that has just hit the stage in the summer of 2017. This little time Yeti Casino has been around, however, was more than enough for players to get familiar with it and to see for themselves that this actually is one of the coolest places to play. It doesn’t matter if you’re with your desktop device or on the go with your faithful mobile phone, Yeti Casino is perfectly accessible through all devices and platforms. Resizable interface and a responsive design will be a perfect fit for your mobile phone’s web browser. All of the games at Yeti Casino will work equally well and without any issues whatsoever on Android, iOS and Windows systems. Yeti Casino’s complete offering is under your fingertips. These days it’s almost becoming customary for casinos to go for a single game provider which usually is one of the top-class names in the industries. 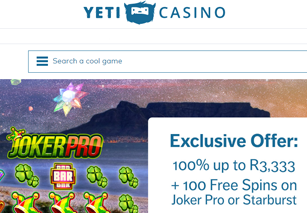 Yeti Casino is not a slave to exclusivity however and its customers will be delighted to hear that there is a wide selection of games from no less than three different suppliers. Amatic, Microgaming and NetEnt as internationally recognised brands provide Yeti Casino with a wide range of completely different style games which will appeal to a broad range of tastes. Yeti Casino customers can try their luck on an extensive portfolio of online slots. The offering includes classic online slots, video slots with exciting game features but progressive jackpot games as well, which can offer life-changing winnings. In addition, Yeti Casino boasts an impressive selection of table games such as roulette, blackjack, baccarat, red dog and Texas Hold’em. Yeti’s Live Casino is a special treat that many of you will enjoy. The first thing that will be thrown your way as you register at Yeti Casino is an enticing 23 free spins no deposit bonus, which can be used on games such as Joker Pro or Starburst. Additionally, once you decide to fund your account with some money to play with, the casino will top up your wallet with 100% matched bonus up to R3,333 which is always a welcome boost to receive. Yeti Casino has a particular kick for Wednesdays as it appears since this brand-new casino has thus far revolved all of its promos around this particular day. A couple of reload bonuses going up to 40% are considered a great boost for the middle of the week. Additionally, the current monthly reload offer every first Wednesday of the month will reward you with a 30% reload if you top up your account on that exact day. There is a nice reload up to R6,000 to be claimed in what definitely is the biggest Wicked Wednesday as they call it over there at Yeti Casino. There are different ways all players can approach casino in case they encounter any issues or have some questions and dilemmas to resolve. A team of skilled and professionally trained customer service representatives can be reached at any time through a Live Chat option available 24/7. Telephone support is also available through a number stated on the casino’s site. Be aware that international charges may apply given the fact Yeti Casino do not have a toll free international line. Email is another option to reach Yeti Casino representatives, as well as the Contact Form which can be found on site. Any self-respecting casino today will have a wide selection of available banking methods as these have long become the proof of a casino’s stability and reputation. If available options are anything to go by while talking about Yeti Casino, then rest assured this particular gambling venue is safe to enjoy. Yeti Casino uses a highly-sophisticated protection system which allows customers to deposit and withdraw from their accounts through a safe and secure payment processor which is compatible with Visa and Mastercard, Paysafecard, Skrill, Neteller, Flexepin, Bank Transfers, iDeal and many other popular options. What do We Think of Yeti as a Whole? Yeti Casino is visually appealing, interesting and innovative gaming venue which offers a different approach to gaming which is intended to be fun and entertaining. Yeti Casino is a responsible gambling house in which you will be guided through a specially designed system that will allow you to set your own limitations in order to avoid addition and problem gambling. A socially responsible casino, Yeti holds a double license – from the MGA and UKGC – which is another validation of their professionalism. You will definitely not regret joining Yeti Casino, one of the latest additions to the gambling landscape, but the one that keeps making huge waves in the industry. Yeti has our warmest recommendation. © Copyright 2019 OnlineCasinoSouthAfrica.co.za. All Rights Reserved.